I suggest that there are too many of us ages 18+ who do not have a basic knowledge of history and therefore are incapable of applying valuable lessons of history to today's issues. That ignorance is evident among members of all parties and movements, all ages. My four brothers and I all received quality educations (public and private schools and colleges). We became an educator, banker, attorney, insurance professional and builder. In our 20's and 30's the outcomes, in terms of our political perspectives, were everything from left to right and in between. Years later, living great distances from each other, our children grown and following their passions, and still coming from widely different perspectives, we easily and civilly share ideas, thanks to technology and our respect for each other. Surprisingly, we find we are in agreement in our disgust with how many political elites from all movements become enamored with power and all sorts of shennanigans. While my brothers and I have differences on how to solve our nation's challenges, we have civil, lively and enlightening conversations. So far we have found one "fix" we all agree on. What do you think that might be? What's yours? In general, we're extremely skeptical and a little hopeful. Be part of that hope. We're adults; we're smarter now, able to do our own historical sleuthing about what really happened years ago and use the lessons of history to clarify the overwhelming, contemporary political swirls. Let's teach our children to examine all information critically. Bring a variety of topics to the table including history, art, music, science, human interest stories et.al. Share opposing ideas with them and ask them what they think. Nurture their questioning skills. Speaking of history, share this with the children, "10 Innovations that Built Ancient Rome." It's amazing. If you really want to brush up on your Roman history, noted historian, Victor Davis Hansen brings a series of essays to us with history and lessons to be learned from history, unlike any history class you ever experienced, for teens & adults: Makers of Ancient Strategy: From the Persian Wars to the Fall of Rome. There's a song from the hit musical "Dear Evan Hansen" that plays on repeat in my head. Twomothers sing an emotional song about the challenge of raising teens, "Does anybody have amap? I don't know if you can tell, but this is me just pretending to know...the scary truth isflying blind and I'm making this up as I go." I'll bet I'm not the only parent who can relate tothis. Although I've been a parent for more than 17 years, I still get lost and need a map to find my way. As my children navigate their way through adolescence and get closer to youngadulthood, I have to remember they're also flying blind and do my best to help them find their own roadmap to independence. This monthly column provides tips and a helpful roadmap for anyone who is raising children, based on the world-renowned Triple P - Positive Parenting Program, available to families in Santa Cruz County. If you have a question or idea for a future column, please email me attriplep@first5scc.org. Stay connected. Teens naturally spend more time away from home or with friends as they get older. Try to find small moments every day to check in, ask how they're doing and talk about things they're interested in. Keep these moments casual and give your full attention, even if it's only for a minute. Those small moments may never feel like enough time, but they send an important message that you're available and enjoy being with your teens. Give them responsibilities. Hold a family meeting and identify the tasks you're responsible for, such as laundry, cooking, cleaning, waking them up, providing transportation and paying the bills. Describe these tasks as important life skills to learn, whether they are living at home or independently. Let them know you will stop doing things they can do for themselves (laundry, waking up) and want them to share the responsibility for doing other household tasks (cleaning, cooking). Teach them one task at a time, providing guidance and encouragement until they "master" each one. This will prepare them to take on other responsibilities outside of your home. Give descriptive praise. Acknowledge your teens' efforts and improvements, such as spending time with you, following family rules, speaking respectfully or helping out at home. Be specific and genuine - e.g. "I appreciate you doing your laundry. It's a big help." This will keep all of you focused on the positive, helpful behaviors and skills they're developing. Let them experience consequences. This will help your teens feel ownership of their choices and actions. If they forget to do their laundry, let them experience the "natural" consequence of wearing dirty clothes instead of doing it for them. In other situations, you might need to usea logical consequence. If they break curfew one weekend, a logical consequence might be not going out the next weekend. FINAL THOUGHTS: Adolescence is a rocky journey for many families that can leave parents and teens feeling like they're flying blind. Positive parenting strategies provide a helpful roadmap for parents as they help their teens discover their own roadmap to independence. "The Western Roman Empire may have fallen more than 1,500 years ago, but its rich legacy of innovation and invention can still be seen today. The Romans were prodigious builders and expert civil engineers, and their thriving civilization produced advances in technology, culture and architecture that remained unequaled for centuries. From aqueducts to newspapers, find out more about 10 innovations that built ancient Rome. The Romans enjoyed many amenities for their day, including public toilets, underground sewage systems, fountains and ornate public baths. 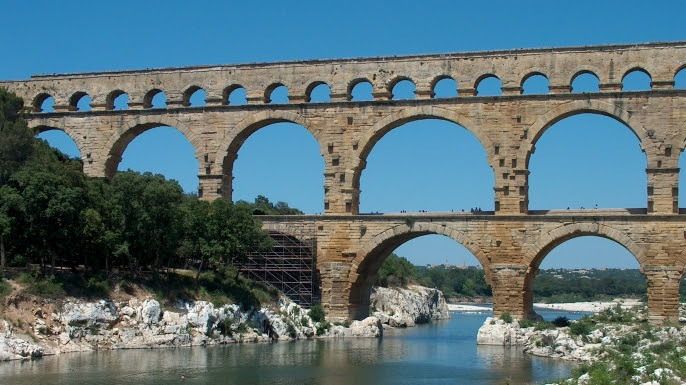 None of these aquatic innovations would have been possible without the Roman aqueduct. First developed around 312 B.C., these engineering marvels used gravity to transport water along stone, lead and concrete pipelines and into city centers. Aqueducts liberated Roman cities from a reliance on nearby water supplies and proved priceless in promoting public health and sanitation. While the Romans did not invent the aqueduct-primitive canals for irrigation and water transport existed earlier in Egypt, Assyria and Babylon-they used their mastery of civil engineering to perfect the process. Hundreds of aqueducts eventually sprang up throughout the empire, some of which transported water as far as 60 miles. Perhaps most impressive of all, Roman aqueducts were so well built that some are still in use to this day. Rome's famous Trevi Fountain, for instance, is supplied by a restored version of the Aqua Virgo, one of ancient Rome's 11 aqueducts." The book reveals that much of the organized violence witnessed today-such as counterterrorism, urban fighting, insurgencies, preemptive war, and ethnic cleansing-has ample precedent in the classical era. The book examines the preemption and unilateralism used to instill democracy during Epaminondas's great invasion of the Peloponnesus in 369 BC, as well as the counterinsurgency and terrorism that characterized Rome's battles with insurgents such as Spartacus, Mithridates, and the Cilician pirates. The collection looks at the urban warfare that became increasingly common as more battles were fought within city walls, and follows the careful tactical strategies of statesmen as diverse as Pericles, Demosthenes, Alexander, Pyrrhus, Caesar, and Augustus. Makers of Ancient Strategy shows how Greco-Roman history sheds light on wars of every age. In addition to the editor, the contributors are David L. Berkey, Adrian Goldsworthy, Peter J. Heather, Tom Holland, Donald Kagan, John W. I. Lee, Susan Mattern, Barry Strauss, and Ian Worthington. click to view website Will We Learn from History?